The theme has been Created especially for construction, building, architecture, company, corporate, electrical, handyman, plumber or electrician, engineering, industry, interior, isolation, maintenance, painting, projecting, renovation, mechanic, transport, carpenter, craftsman workshop, painter or similar craftsman or repair business website. Visual Composer Page Builder for WordPress ($34 value) included free: Ultimate plugin for building every WordPress site without coding. The only WP Page Builder that powers 1+ million sites. WooCommerce Ready: Constro theme comes with complete support for the WooCommerce plugin, which enables you to sell your products online. This popular e-commerce plugin will help you to setup a clean and modern shop. 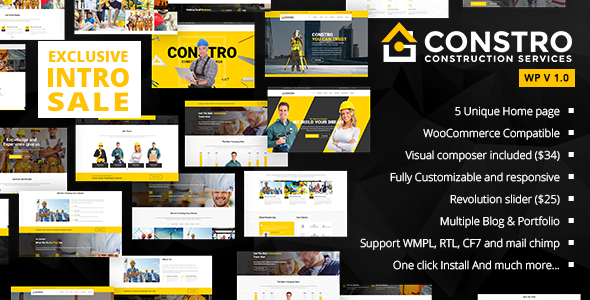 100% WPML Multilingual Plugin Ready: Constro theme is fully compatible with the WPML multilingual plugin and we have tested the theme completely with this popular multi-lingual plugin to help you easily translate to your website. 800+ Google Webfonts to Choose From:The theme integrates Google Web Fonts, offering you a large variety of typefaces to choose from when customizing the theme. Translation Ready: Constro is fully prepared for translation to any language using po & mo files. Unlimited Colors options: Constro comes with unlimited colors. You will have thousands of way to change the appearance, according to your preference and your brand. Advanced Blog Options: Different blog post formats including standard, quote, HTML5 video, youtube video, vimeo video, gallery and audio. With Classic, Left Sidebar, Right Sidebar, Full Width, Masonry, 2 Column, 3 Column…. Portfolio Options: Best way to showcase your work with Fullwidth, 3 Columns, 4 Columns and Details. Retina Ready: Constro comes with high-resolution icons. With Constro your website will look awesome on high-density Retina displays and high-resolution screens. 5 Stunning Home Page Options: With 5 different and unique demo homepages gives you options to build your own site. Multiple Header options: Constro comes with Multiple Header options to choose from, each header has its own set of options, is sure to satisfy your every need. you can change header text color, link color and background color. Tons of Pages options: 60+ Pre-configured page layouts for Home, About, Service, F.A.Q., team, Portfolio, Blog, Contact and more! Fast Performance: High performance, super fast with top page speed & yslow ratings. Layout options: Boxed, Framed, Rounded and Full Width. With Boxed, Framed and Rounded layout you can also set main body background image or color. Sticky Header: Enable/disable stick header for the desktop device and also for mobile device. you can also change sticky header logo, text color, link color and background color. Site Preloader option: Enable/disable Site Preloader. Set preloader type from our 16 pre-loader GIF images or upload your own pre-loader image. Site Header: You can manage site header settings here, like Header Type, Header Colors, Top Bar, Top bar Colors and other various settings. Topbar: Enable/disable top bar. You can manage left top bar and right top bar items from here with drag and drop option. Custom CSS/JS: You can add Custom CSS and Custom JS here. Constro comes with a detailed documentation. If you have any further questions Contact us We’ll be glad to help you!